Long and conical in shape. Like all peppers, color ranges from green to red as the pepper matures. Mildly sweet flavor, excellent for frying. Used in Italian cooking in pasta, pizzas and salads. Used in Italian cooking in pasta, pizza, as a component to peperonata. They are delicious braised with San Marzano tomatoes and served with sausage and polenta. 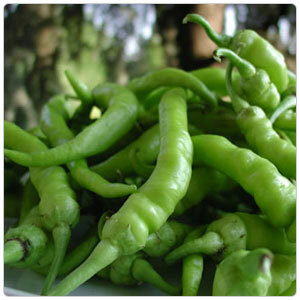 Italian Frying Peppers pair well with poultry, game, fish, lamb and pork. They are often stuffed with anchovies and breadcrumbs for a unique appetizer.